Hostal Centro is located in the heart of Toledo, in Zocodover Square. Located around 200 metres from Puerta del Sol Toledo, the guest house is also a 4-minute walk away from Toledo Cathedral. Free WiFi is provided. At the guest house, all rooms are equipped with a desk and a flat-screen TV. Hostal Centro provides some units that have city views, and every room is fitted with a private bathroom and a wardrobe. The accommodation can conveniently provide information at the reception to help guests to get around the area. The property building has a lift, accessed by a small set of steps and a ramp. City hall is 200 metres from Hostal Centro, while Mezquita Cristo de la Luz is a 2-minute walk from the property. Adolfo Suarez Madrid-Barajas Airport is 79 km away. Make yourself at home in one of the 53 air-conditioned guestrooms. Complimentary wireless Internet access is available to keep you connected. Conveniences include phones and desks, and housekeeping is provided daily. This brand new, small hotel is located in the cultural heart of historic Toledo. It belongs to the well-known restaurant set next door. The modern Hostal Palacios provides comfortable and convenient accommodation in this impressive city, set to the south of Madrid. Air-conditioned rooms are decorated in a warm, rustic style and feature plasma-screen satellite TVs and views of Toledo’s old town. The property also has its own internet point, which you can use to plan your trip to the magnificent Alcázar and other local attractions. After a day’s sightseeing you can return to enjoy the delicious traditional cuisine served in the adjacent Restaurant Palacios. Hostal Alfonso XII is in Toledo's beautiful Old Town, next to the Cathedral, the El Greco Museum and the Santa María La Blanca and Tránsito Synagogues. The guest house is set in a historic building in central Toledo. Original details include sloping wooden ceilings. There is free Wi-Fi internet. Most of the rooms have a private balcony. Rooms are air conditioned and heated. There is a glass shower in the en suite bathroom. The Alfonso XII is a short walk from Toledo’s sights, as well as a wide range of restaurants and bars. These include the synagogues, the Mezquita del Cristo de la Luz, and the San Juan de los Reyes Monastery. With a stay at Hotel Domus Plaza Zocodover, you'll be centrally located in Toledo, just a 4-minute walk from Alcazar and 7 minutes by foot from Toledo Cathedral. This hotel is 0.1 mi (0.1 km) from Plaza de Zocodover and 0.1 mi (0.2 km) from Santa Cruz Museum. Recently restored 16 th. century house, built on the site of an ancient 11th Century Muslim Palace. Located in the centre of Toledo old town, near the Cathedral. It is on one of the main streets used by anyone wishing to fully visit the city. It has ten rooms with en-suite bathroom, air conditioning throughout the hotel, TV, telephone, and e-mail service. We are equipped to be turned into a four star hotel but listed as a Hostel. There is a gift shop, in addition to the reception area and a sitting room with coffee service on the ground floor. Located on a building from 1450, La Posada de Manolo is situated in Toledo City Centre, 100 metres from the Cathedral. This medieval building offers a very special décor, each floor represents one of the historic cultures from Toledo: Arabic, Jewish or Christian. Each air-conditioned and bright room has a décor inspired in medieval professions. Rooms are equipped with a TV, and a private bathroom with a shower, free toiletries and a hairdryer. La Posada de Manolo features free WiFi throughout the property. A continental breakfast is available at the property, ou will find a 24-hour front desk at the property. 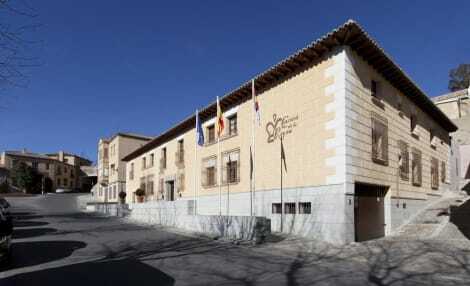 The Seminario is 300 metres from La Posada de Manolo, while Puerta del Sol Toledo is 500 metres from the property. The nearest airport is Adolfo Suarez Madrid-Barajas Airport, 79 km from La Posada de Manolo. Make yourself at home in one of the 295 air-conditioned rooms featuring minibars and LED televisions. Rooms have private balconies. Complimentary wireless Internet access keeps you connected, and satellite programming is available for your entertainment. Bathrooms have complimentary toiletries and bidets. With a stay at Hotel Cigarral El Bosque in Toledo, you'll be on a river, within a 15-minute drive of Toledo Cathedral and Puerta Bisagra City Gate. This 5-star hotel is 2.8 mi (4.6 km) from Alcazar and 1.3 mi (2.1 km) from Church of Santiago del Arrabal. This hotel is located in the tourist centre of Toledo just a few minutes walk from the resort centre where guests will discover an abundance of shops, cafés, bars, restaurants and nightclubs. Links to the public transport network can be found just a stone's throw away, lying some 500 m from the hotel. Renovated in 2002, this 2-storey hotel comprises 27 rooms of which 2 are junior suites. Facilities within this air-conditioned hotel include a bar and an air-conditioned restaurant and an in-house laundry service is also available to guests. Each of the welcoming, comfortable rooms comes with an en suite bathroom with a hairdryer, a direct dial telephone, air conditioning and central heating. lastminute.com has a fantastic range of hotels in Toledo, with everything from cheap hotels to luxurious five star accommodation available. We like to live up to our last minute name so remember you can book any one of our excellent Toledo hotels up until midnight and stay the same night.